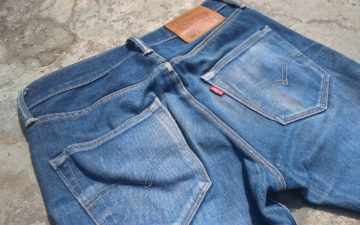 Click here to check out Part I of our Guide to Okayama Jeans Street. Last week, we discussed the ins and outs of the North Area of Okayama Jeans Street (blue section on the map below). Today, we’re focusing on its South Area (pink section on the map below). Most of our readers will probably relate more to this second part as we’ll introduce names that we’ve talked about before. Apologies to those of you who wished there were more photos of the inside of the stores, please understand that for some of them there were too many people inside for us to get any good shots. Open from 10AM to 7PM, all year except for the New Year’s Holidays. The first store you’ll see when getting in the second part of Jeans Street is BLUXE. It’s in fact the most recent store of the street, and it’s operated by Rampuya & Co, which makes it their 4th label. The brand is priced higher than Momotaro Jeans, and aims at providing the customer with a high-end experience thanks to the luxurious aspect of the store, the service quality, the packaging, and of course, the products. The brand sold at BLUXE is called SOULIVE. They sell tops, bottoms, and accessories, inside an impressive ancient house. After walking a little bit, turn to the left to enter the last section of Jeans Street. As we’ve said before, everything here is dedicated to denim, and if you truly pay attention, you’ll notice how far the Japanese can go with their passions. Doesn’t the street line remind you anything? Open from 9AM to 6PM, all year except for New Year’s Holidays. Closed on Mondays. Kamikaze Attack is probably one of the freshest Japanese denim labels at the moment as their collaborations with Tate + Yoko and with Naked & Famous demonstrate. Compared to other stores, the outside isn’t very fancy, but in fact for a down-to-earth brand like Kamikaze Attack, that’s exactly what you’d expect. The magic happens when you enter the store: half shelves, half small atelier, and hidden in the corner you’ll see (or hear) the CEO Norihiko Kanazawa playing instruments. He truly is a singular character and talking to him is always a great pleasure. Open from 11AM to 6PM, only on week-ends and national holidays. Very close to Kamikaze Attack is Pure Blue Japan, a brand that doesn’t really need an introduction. Their great fades have earned them a comfortable spot in our Fade Friday section. As opposed to the North Area of the street, in which you can see many more stores built inside traditional buildings, the South Section is mainly composed of modern buildings instead of older houses, which gives the stores a cleaner look. Open from 10AM to 7PM, all year, closed on Thursdays. We’ll finish the tour with a brand that has yet to be introduced to the world as it is merely known in Japan. 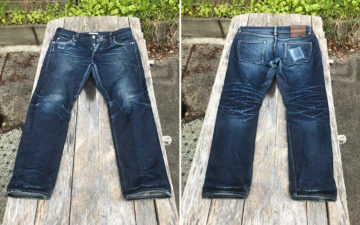 Kojima Genes produce mostly workwear and denim of various designs and weights starting from 13oz, check their 29oz heavy weight jeans. Not to mention that the prices are very attractive. We unfortunately could not cover all the shops present in the street. If you look at the map at the top of this article, you will notice that there are many more left for you to visit. Remember, Jeans Street is built in an ancient street, thus on top of being able to visit your favorite brands and discover new ones, you will also enjoy a beautiful view. We wish to personally thank Tatsushi Tabuchi who took the time to walk us through the street and tell us its secrets!